If you are customizing a fresh new Mac, then this post from Hongkiat.com is great for you. In this article, or checklist for the things you may need to do when you start your machine up for the first time and after it. If this is not your first Apple device, chances are you already have an existing iCloud ID and/or App Store ID. If you wish to have your emails, contacts, calendars, Safari bookmarks, iPhoto photo streams properly sync’ed, you’ll need your iCloud ID. If you wish to be able to re-download previous purchased app without paying again, you’ll need your App Store ID. II. What To Name This New Mac? During the installation, you’ll be ask to fill in the username and the computer’s name. The username should be a no-brainer; but pay a little attention to the latter. Your computer name will show up in networks you connect to as well as if you are a Terminal user. You can get them changed later, for one reason or another, but it’s better to get it right from the start. We suggest using the naming convention of: [Firstname]‘s [Device]. III. Is Your Internet Connection Working? To get your iCloud properly set up, you’ll need a working Internet connection. The installation can be done without an Internet connection, but it’s best to get everything set up complete from the very start. Apple releases updates from time to time, so there is a chance that the new OS installed has yet to be updated with the latest fixes. Check for a system update before doing anything else to avoid double work. Do it once, twice, or until there’s no update required. If you work exclusively with the track pad, you need to calibrate it. By default. when you scroll down, the track pad page scrolls down. 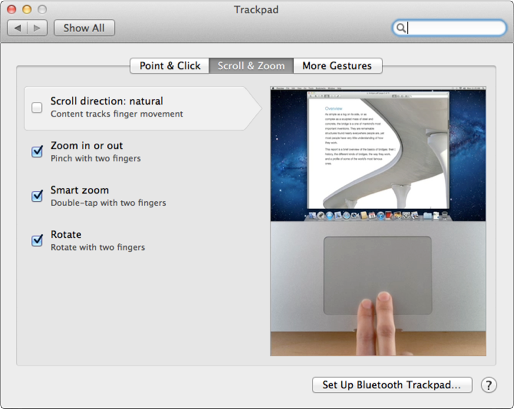 if during the test run, it doesn't feel natural go to System Preferences > Track pad > Scroll & Zoom and unchecked "Scroll direction: natural"